PCI to 2-slot PCMCIA PC Card / Cardbus Front Drive supports any kinds of 3.3V and 5V PCMCIA/Cardbus cards. It shows 2 icons in My Computer and allows Cardbus or PCMCIA card's Hot- Swap without power off system. The reader is an easy and quick installing to extend more PCMCIA/ Cardbus card devices for any desktop PC. PCI interfaces compatible with 3.3V and 5V PCI signaling environment. .
Mix-and-match 5V/3.3V 16bits PC cards. Dual PC Card Slot with hot insertion and removal. Sanyo OS-CON Solid Capacitor design. Supports ATA Flash Card, CF Card w/ CF Adapter, SM w/ SM Adapter, IBM Microdrive, type III Hard Drive, Sony Memory Stick +Stick Adapter, Linear Flash Cards (AMD, Intel II & II+, etc. chipsets), SRAM Card, Fax Modem Card, LAN Card, Panasonic P2 Card, Wireless LAN card, I/O card, etc. PCD-TP110CS/ PCD-RP220CS is a high-performance PCI-to-PC Card Drive Unit that supports one independent card socket compliant with the 16/32-bit PC Card standard defined in 1997 PC Card Standard. Provides a rich feature set that makes it the best choice for bridging between PCI and PC Card in desktop computers. Compliant with the 16-bit PC Card specification defines in PCMCIA Release 2.1 and JEIDA 4.2 and can support any combination of 16-bit or 32-bit PC Card in the one socket, powered at 5V or 3.3V as required. The host system interface of PCD-TP110CS/PCD-RP220CS is compliant with the PCI Local Bus specification 2.2. PCD-TP110CS is register set compatible with Intel 82365SL controller and compatible with ExCA, it enables the PCD-TP110CS/PCD-RP220CS to support almost all of the PC Card applications including: SRAM card, Linear Flash card, ATA Flash card, Modem card, Wireless LAN card, Panasonic P2 card, and Mobile broadband card. * PCD-TP110CS/PCD-RP220CS provides one/two front-access PCMCIA / CardBus socket solution for PC. * PCI Local Bus Specification Revision 2.2 compliant. * PCMCIA 2.1, JEIDA 4.2 compliant. 3.3V, 5.0V, or mixed 3.3V/5.0V operation. * Intel 82365SL register compatible, ExCA compatible. 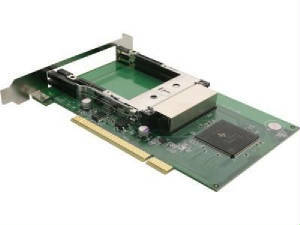 * The 3.5" front Drive Unit with built-in one socket is connected to the PCI Interface Board by using the flat ribbon cable. * There are one PC card socket that can be used for Type I / Type II / Type III PC Card in this unit. * Support IRQ steering (PCMCIA -16Bit), native driver built in Windows XP. PCMCIA: 8/16 Bit, 8 MHz, 3.3/5V. CardBus: 32 Bit, 33 MHz, 3.3 V.